Wave energy is one of the largest unexploited clean energy sources on earth, and one day it could potentially power millions of households across the United States. Although it has been years since the power of ocean waves was first analyzed, wave energy continues to be one of the toughest energy sources to harness. In order to enhance the performance of wave-energy converters (WECs), engineers at Sandia National Laboratories are performing the largest model-scale wave energy testing. This research project is being conducted at the U.S. Navy’s Maneuvering and Sea Keeping facility at the Carderock Division in Bethesda, Maryland, which is one of the largest wave tanks in the world. This tank measures 360 ft in length and 240 ft in width, and can contain up to 12 Mgal water. Ryan Coe and Giorgio Bacelli who head the Sandia project spend long hours in the dark wave tank. As the tank is dark, the growth of algae in the water is minimized. 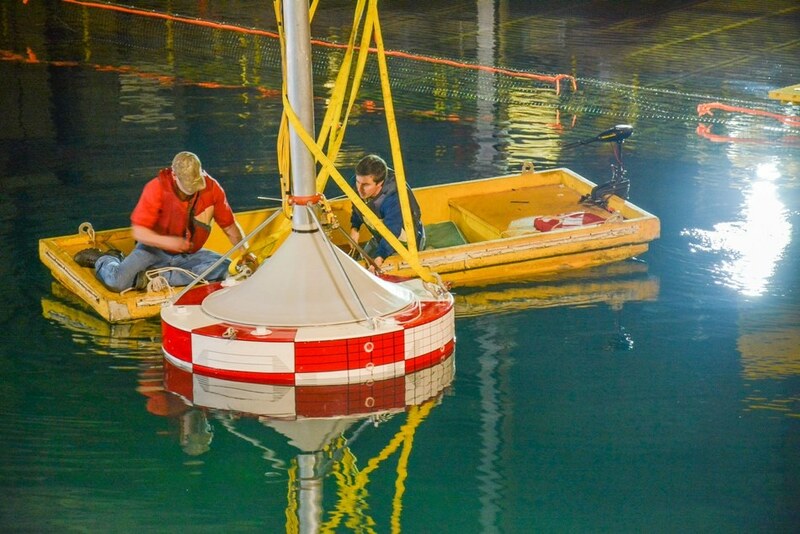 The researchers are collecting data from experimental research and numerical modeling, so that wave energy technology can benefit from the strategic control systems design, testing practices for wave energy converters and improved methodologies. Our goal is to improve the economic viability of these devices. In order to do so, we are working out ways to control the WEC’s generator to increase the amount of power it absorbs. At the same time, we are looking at how to reduce the loads and stresses on these devices in harsh conditions to ultimately lengthen a WEC’s lifespan in the water. According to Coe, many preliminary studies suggest that the energy absorption capacity can be increased up to 300% by improving control of the WECs’ generators. The present challenge confronted by the team is to transform these simplified studies into more realistic large-scale devices. Coe and Bacelli are using control techniques and modeling that have already proven to be successful in other industries like aerospace, to control the dynamics, and obtain better and quicker results. The systems we used have been around for a while, but strangely enough they had never been applied to wave energy converters. So far, we know the techniques we are using are more efficient and cost-effective than existing methods. We are getting more information in a fraction of the time. As the initial round of analysis in the water has now been completed at Sandia, Coe said that the team would be focused on processing all the collected data and building a new and better model to ensure that subsequent test yields even more valuable results. Sandia is continuing to work on the ‘Advanced WEC Dynamics and Controls’ wave energy project that started in 2013. The Office of Energy Efficiency and Renewable Energy has funded this project. Since renewable energy will be made more cost-effective because of the innovations from Sandia’s Water Power Technologies Program, there is scope for the energy security of the United States to improve. Some of the contributions of this project include turbine and tidal modeling, extreme-conditions modeling and WEC-Sim, which is an open source code for modeling the performance of wave energy converters. Sandia researchers also serve as judges and advisers for the Department of Energy’s Wave Energy Prize competition.